There’s a small possibility that the United States Mint on Wednesday will increase prices on its collectible gold coins. 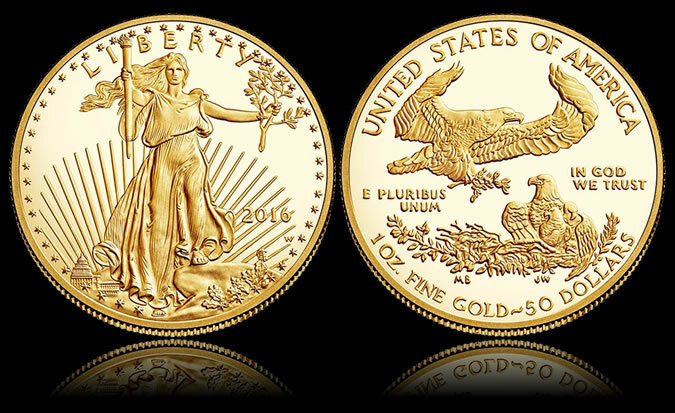 The Mint on Wednesday will also establish pricing for upcoming 2016-W Proof American Gold Eagles. They go on sale Thursday at noon Eastern Time. U.S. Mint policy for its line of collector gold coins is to set their prices based on a weekly average of London gold. That policy has resulted in three rounds of adjustments this year. The last one happened a month ago when gold’s weekly average moved higher into the range of $1,200.00 to $1,249.99 an ounce. Last Thursday, gold spiked to a 13-month high near $1,273 an ounce. While prices have fallen sharply since — now around $1,232 an ounce, the yellow metal’s weekly average is still slightly within a higher tier. If Wednesday’s LBMA gold price for the AM moves to above $1,244.30 an ounce and its PM price is atop $1,249.99 an ounce, then prices on U.S. gold coins will climb by as much as $50 for every ounce of gold they contain. The following table summarizes the current and possible higher prices, and includes the upcoming 2016 Proof American Gold Eagles. Products with an asterisk (*) have been unavailable for some time. Past adjustments have tended to happen on Wednesdays at around 2:00 p.m. ET. This article will get updated with what actually happens. Update: Falling gold averted increases in coin prices. The above gold coins are found on the U.S. Mint’s website page located here. The 2016-W centennial Winged Liberty Head “Mercury” dime coins in 1/10 ounce .9999 gold have all been struck at the West Point Mint already & will be available April 21. No pictures yet of the actual coin on the Mint’s website, but it will be a regular circulation strike & not a Proof or special finish, but will be in a nice wooden box. Should be very popular & might overwhelm the Mint’s website due to popularity. I’ll be buying GOLD this year, FOR SURE! I certainly wouldn’t mind skipping the box to save $40 or whatever they’re charging for the special packaging. If they’ve all been struck, wouldn’t that imply no Mint to Demand? And no Back Order status? I was hoping for a separate 3-coin box to display all three coins together to be purchased separately, I can certainly do without 3 separate boxes. NumisDude, from your experience, what are your thoughts on an ideal mintage for the Merc that you would like to see, or protect some numismatic value? SLQ mintage? I have not heard of a mintage figure yet, but would like to see around 50,000 with 1 per household limit. But, it is the smallest of the 3 centennial gold coins & therefore will be the most affordable so they may go higher on the mintage since more people will likely be inclined to order one. Just my guess at this point. Yeah, I’m in favor of some forms of constraints so we don’t end up with over priced bullion from gross over purchases from dealers and flippers. I’m growing tired of paying steep numismatic premiums ONLY to have to offering sit for 6 months to a year and then loose that premium ‘value’ in the after market within months of the release. I was thinking about 20% higher than your guestimate, therefore I like your number better. We’ll see the week of 21 April I suspect as the mint has gone zipped lipped about everything this year.., great customer relationship management!